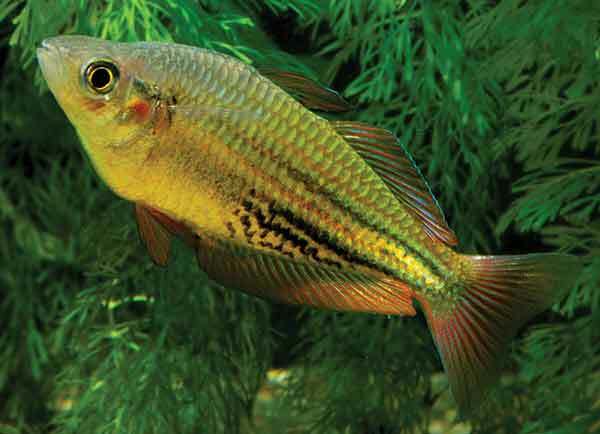 The Australian New Guinea Fishes Association makes a bid to save the Running River Rainbowfish, an undescribed species about to disappear due to interbreeding with an introduced rainbowfish. The January/February Issue of AMAZONAS Magazine is printed and now delivering to print magazine subscribers, local aquarium shops. Here is a sample of articles and opening pages for readers wondering what the issue will deliver. On sale date: December 8th, 2015 at the best tropical fish retail stores everywhere. All show entries are pairs and are brought to the group to be auctioned off at the end of the show, with the top bid reaching $190 and many attendees saying that the event had attracted a number of fish rarely, if ever, seen at North American shows. “A titan among dwarfs,” is what scientists Henrique Varella and Mark H. Sabaj Pérezare calling Apistogramma kullanderi, the newest member of a popular genus of dwarf cichlids who described the largest known Apistogramma species, reaching lengths of more than three inches (80 mm). The November/December Issue of AMAZONAS is printed and now delivering to print magazine subscribers, local aquarium shops, and readers of the Digital Editions (available for desktop and laptop computers, as well as smartphones, tablets and Kindle readers).